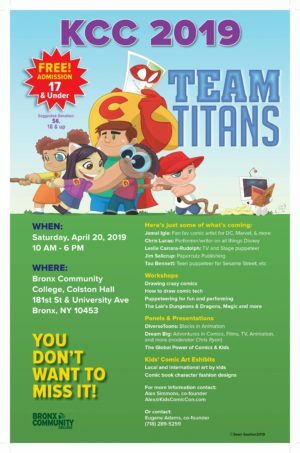 NEW YORK (APRIL, 2019) – Kids Comic Con (KCC) the annual children’s outreach event is celebrating its 13th annual event, Saturday, April 20th at the Bronx Community College from 10 a.m. to 6 p.m. This year’s theme is all about how heroes everyday and super-powered can WORK together to save the day , hence the theme, TEAM Titans! This is a great event for families and we hope to inspire the love of learning and creativity. Paul Castiglia has been editor and writer on a series of comic books including various Archie titles, Teenage Mutant Ninja Turtles Adventures and Sonic the Hedgehog. He was the head writer on all 34 issues of Archie’s Weird Mysteries/Archie’s Mysteries and was a contributing writer to several issues of The New Little Archie Digest Comic Magazine. Over a span of 20 years, Castiglia had an editorial hand in all 12 volumes of the Archie Americana Series and various collections of vintage Archie stories, including volumes featuring the various Mighty Crusaders, and Josie & the Pussycats. Paul has also written for DC Comics, Dark Horse, Antarctic Press and Cracked Magazine, on a variety of characters including Tex Avery’s Wolf & Red and Droopy Dog, and Superman’s pal Bibbo. Non-fiction projects include TwoMorrows’ The MLJ Companion, co-written with Rik Offenberger and Jon B. Cooke and charting the history of Archie’s superheroes; and the upcoming Scared Silly – a compendium of reviews of classic horror-comedy movies. Paul is also a film historian who speaks at classic film screenings, and a movie producer whose first film, Bowery Rhapsody, a documentary about the Dead End Kids, East Side Kids and Bowery Boys is currently in post-production.